Sometimes it’s amazing what you find when you select an element and then use the right click function. Curtain walls or curtain systems is one such situation where you will really wish you knew this six months ago. Select a curtain wall and right click on your mouse. You will notice there are some very handy selection tools for the Curtain panels and Mullions. Now select a curtain panel and use the right click function. I’m also sure you saw the “Select Grid” function. For the life of me, I cannot see how this selection works. 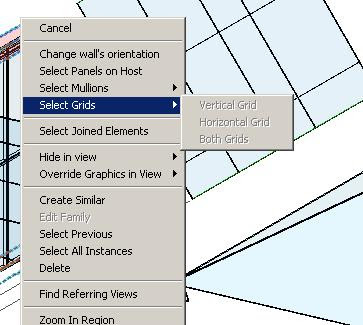 No matter what Revit release I use, or what kind of Curtain System or wall I select, it is grayed out. All I can guess is it was intended to be a function, and programmer X from Autodesk forgot to put the coding in. Anyway what works from above will be very helpful.